A case study on how restaurant web design with SEO, usability and conversion in mind can lead to substantial financial returns. Since opening their first restaurant in 1987, the team at BR Guest Hospitality in New York have emphasised excellent service, exciting style, and accessible cuisine. We were chosen to re-design and develop the central group website and all the individual brand websites for BR Guest in 2011. After two years of carefully tracking the success of the project, as you will see from the numbers in the result presented below, the returns on carefully planned and executed online marketing can be substantial. increase conversion (amount of reservations) from the websites. 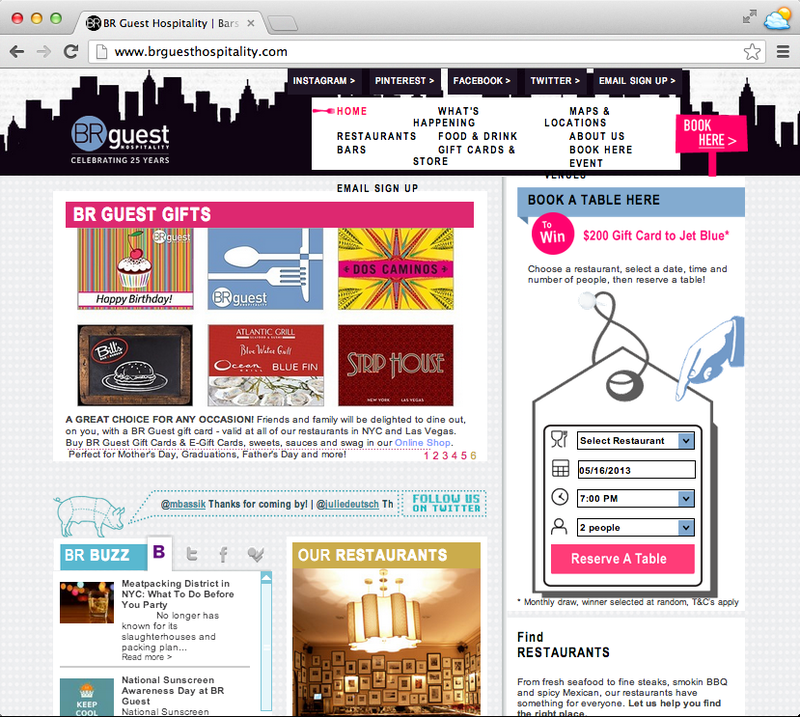 improve the websites' usability to remove all obstacles to make a reservation. With a large and diverse brand portfolio, careful analysis was undertaken to define the unique aspects of each brand in order to make the marketing campaigns and brand websites as efficient and persuasive as possible. Based on a dynamic and fully customisable Content Management System templates were designed that could be reused across all brands, without sacrificing the unique style and personality crafted for each restaurant. This allowed for a lot of reuse of code and website structure, saving money in implementation. Including custom blogs for each brand, the Content Management System also allows the Marketing Managers at BR Guest to update and maintain the websites in house. As part of the Content Management System implementation, Search Engine Optimisation was carefully built into each website based on the important keywords and search phrases that would help each restaurant brand show up at the top of Google. Social media was also integrated into each website, showing visitors the latest activities on Twitter, Facebook and Foursquare by each restaurant and the restaurant fans and followers. Knowing that getting lots of traffic to a website isn't enough, every aspect of the websites was designed with usability and conversion in mind. Making your website easy to understand and use is key to make sure you get as many reservations as possible. Mobile optimisation for each site was a clear priority, with smartphones being a very common device used to access restaurant websites. An easy to use booking module was added to the websites in such a way that wherever a visitor would arrive at the site, making a booking or signing up for their newsletter would only be a click away. With our passion for building restaurant websites that convert visitors to business value comes an equally strong passion for tracking success. When it comes to online marketing you don't need to guess if a particular effort or campaign yielded results. Using proper tracking tools the result will be as clear as day. Thanks to the careful planning job, and the hard work in executing the online marketing strategy, we've seen amazing improvements in key metrics for BR Guest. Through the highly converting websites, online reservations increased substantially. Together with BR Guest we were also happy to receive the WebAward for Oustanding Achievment in Web Development, high praise from the Web Marketing Association. Online marketing works, and the digital channel is one of the most important ones to get right for restaurants. At Ignite we know how to build websites and design campaigns that drive traffic and increase reservations. Contact us today to learn how we can help you create a richer online experience and increase your restaurant's online visibility!